Many of us will face at least a temporary disability during our lifetime requiring some alterations to our living space. Those changes which will greatly aid in maneuvering through our daily routines. The temporary or permanent use of mobility devices signifies a lifestyle change in anyone's future often as a result of an accident. This situation can make getting around safely in our home much more difficult when planning for a disabled veteran. The often used daily paths in their lives will be disrupted and complicated if they find themselves needing to use a wheelchair or walker as a permanent means of mobility. Keeping ourselves independent requires planning during handicap remodeling projects providing accessible routes throughout the home. Sometimes just entering the home can be a problem if you find yourself in a wheelchair pondering on how to negotiate the steps leading to your front door. Traditional home builders have never considered the issues affecting mobility for the disabled or elderly. ADA remodeling and universal design ideas begin at the front door using ramps to get around any stair issues. The front door will need to have locking hardware complying with special needs users like levers. Once inside the home, an accessible design and designated route will let you reach the kitchen or bath without restrictions. The adjusted clearances between walls within a hallway will be wide enough (42" or more) for a smooth passage. Widening the entrances to all rooms to 32" or greater means you can now maneuver throughout the home. By using the correct lever door hardware you will no longer impede mobility creating frustration while attempting to move about. Having an unobstructed turning radius of five feet within each room is also very important for wheelchair maneuvering, especially in the bathroom. What really defines the accessible homes of Austin? Barrier free architectural design and accessibility for all who enter the structure while approaching the main living areas of the home in question is a fair definition. Universal design and aging in place trends have taken hold in the residential remodeling industry. The current housing inventory doesn't offer the features needed for safety and accessibility in the numbers needed to accommodate the ever growing demand. It is ultimately up to the individual homeowners and their families to plan for future housing needs. Once it is discovered that modifications to an existing home are not possible to accomplish total accessibility then it is time to consider a newer or custom built accessible home. What are the main design issues regarding aging in place home modifications in Austin? Low maintenance with little need for landscaping or exterior upkeep which could translate into newer rather than older homes that are the accessible homes of Austin. An accessible level entry either achieved with ramps or the rare flat lot in Austin. Consumers are looking for the free maneuverability that more open floor plans offer having greater clear unobstructed floor space. Wider doorways and unobstructed accessible routes are truly a concern. These structures will provide flat floors without transitions requiring steps or stairs to move around. An accessible master suite and kitchen located on the same floor is preferable. If two story homes are mandated by the community then the guests will inhabit the second floor. If the master suite needs to be located on the second floor then closets can be stacked to house a future elevator installation. Evolving kitchens have sprung up due to the more open floor plans. Fewer wall cabinets, lowered cabinet tops, pullout shelves or specialized drawers, and a reduced number of mobility obstructing doors represent the evolution of today's cabinetry. Knee spaces can be incorporated into a kitchen design for roll under access to the sink, prep area, and cook top. Higher toe kicks can facilitate greater wheelchair access. Appliances are being installed at more comfortable heights due to decreased reach distances and bending motion. Raised dishwashers, refrigerator drawers, dish washing drawers, and non-stacked double ovens are just a few changes within the appliance world. Microwaves can be installed below the cabinet top and cook tops with controls located on the front represent another appliance metamorphosis helping with reach problems. The lack of cabinet doors creating a new accessible open look for cabinetry is taking hold on the market. This is becoming more popular in both the bath and kitchen of accessible homes. Bathroom vanities with universal height cabinet tops and open knee spaces are taking over the marketplace. These new residential vanities do not need to look institutional. They can be designed like any other piece of fine furniture. Comfort height toilets covered with any one of a multitude of available seats to fit every need prevent deep knee bends required for seating. Curbless roll in showers are advised for everyone on a universal level. 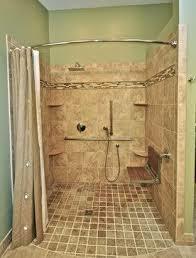 The shower should contain at least a shower wand on a sliding bar to be available for varying heights of use along with a regular height shower head with diverter control if desired. Folding seats are useful if caretakers are involved and secure grab bars around the shower perimeter will increase the safety factor and prevent falls. All of the bathroom floor surface must be nonskid to prevent slipping on a guaranteed wet floor. Finding a contractor familiar with the guidelines of accessibility can be quite difficult. Be sure to check out the credentials of any potential bidders you contact. Be sure they understand that the alterations you are seeking are for wheel chair accessible home remodeling and modifications. Furthermore be sure this person knows and practices both the federal and most importantly your state's requirements before entering into any contract. Let's face it, accessible homes are needed by all of us at some time in our lives. This is true whether it's for ourselves, a family member, or a guest. The need is certainly not driven by age but is a result of life's experience. Any family living with disability among any of the generations within it's group can always benefit from additional accessibility. This will in turn increase safety and independence for all involved as they go through life.